Zanata Ide L, Santos RS, Hirata GC. Int Arch Otorhinolaryngol. 2014 Apr;18(2):108-14. doi: 10.1055/s-0033-1363467. Epub 2014 Jan 6. 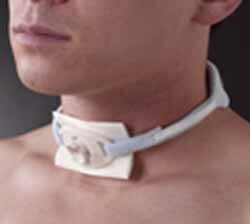 Introduction The frequency of tracheostomy in patients with traumatic brain injury (TBI) contrasts with the lack of objective criteria for its management. The study arose from the need for a protocol in the decision to remove the tracheal tube. Objective To evaluate the applicability of a protocol for tracheal decannulation. Methods A prospective study with 20 patients, ranging between 21 and 85 years of age (average 33.55), 4 of whom were women (20%) and 16 were men (80%). All patients had been diagnosed by a neurologist as having TBI, and the anatomical region of the lesion was known. Patients were evaluated following criteria for tracheal decannulation through a clinical evaluation protocol developed by the authors. Results Decannulation was performed in 12 (60%) patients. Fourteen (70%) had a score greater than 8 on the Glasgow Coma Scale and only 2 (14%) of these were not able to undergo decannulation. Twelve (60%) patients maintained the breathing pattern with occlusion of the tube and were successfully decannulated. Of the 20 patients evaluated, 11 (55%) showed no signs suggestive of tracheal aspiration, and of these, 9 (82%) began training on occlusion of the cannula. The protocol was relevant to establish the beginning of the decannulation process. The clinical assessment should focus on the patient’s condition to achieve early tracheal decannulation. Conclusion This study allowed, with the protocol, to establish six criteria for tracheal decannulation: level of consciousness, respiration, tracheal secretion, phonation, swallowing, and coughing. Este post foi publicado em Dysphagia em 28/07/2015 por Tatiana Simões Chaves.